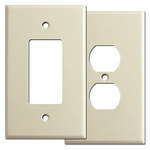 Elegant solid ivory switch plates add a touch of sophistication. Choose from over 200 sizes made in USA. Classic ivory switch plates are a wonderful way to add elegance and sophistication to a living room, bedroom, or any room of your home. With their clean lines and availability in over 200 sizes, these solid ivory color wall plate covers will allow you to create the room of your dreams. Whether you need oversized switchplates for installing on granite or narrow light switch plates for electrical boxes too near a cabinet, you can find every size you need. 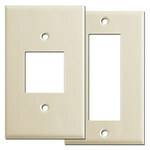 Will these ivory switch plates match the switches and sockets that are currently installed in my house? When attempting to match a currently installed plastic electrical device or wallplate keep in mind that your old items likely have darkened over time making an exact match impossible. Is every "ivory" device on the market now the same color? No. Ivory electrical devices vary in color more than any other series. There are various reasons for this. First, electrical manufacturers each have their own shades of "ivory" which often vary from one line to another within their collections. Older product lines typically are a classic ivory that has been used for decades. Newer lines often have an updated ivory that is trending toward a fresher, lighter color. Next, perceived color is also affected by finish of device as well, i.e. gloss vs. satin. Furthermore, ivory devices tend to darken noticeably over time from exposure to air, sun, or smoke, making them impossible to "match" with recently purchased devices. 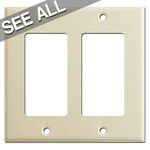 This photo shows various brands of ivory switches installed in light ivory wall plates (above). If you are ordering ivory light switch covers for existing ivory devices and want the most uniform color scheme, consider upgrading all of your devices at the same time and selecting devices within the same manufacturer's specific product line. Is there another finish that's between Ivory and White? 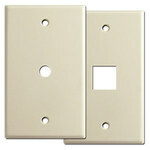 What is the finish on these ivory light switch covers? 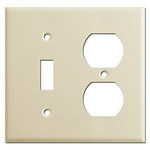 Ivory wallplates feature a smooth, semi-gloss baked powder-paint enamel finish on durable .030" steel that coordinates well with either gloss or satin ivory electrical switches, making it easy to complete your electrical project. Can I paint these switch plates to match my wall color? Yes. You must prime them before and then you can paint them. What other electrical devices go with ivory plates? We've decided to go ahead and remodel our kitchen this summer. My home is mostly decorated in the country style. Would ivory cover plates be a nice match? Our ivory switchplates are a lovely shade of bone, often likened to the color of an elephant tusk with a slight hint of yellow and very pale green. The majority of our customers who purchase ivory switch plates have told us that their homes are decorated in a traditional, country, vintage or French style and have been satisfied with the results. I'd like to use these ivory wall plates in each room but don't want them to look too matchy-matchy. Should I buy them for my entire home or only install them in certain areas for character? 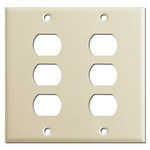 Ivory switchplates have a warm quality due to the pleasant shade of their finish. 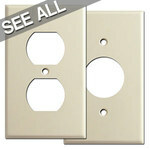 The color of these cover plates is very subdued and non-intrusive when installed on the wall, even in every room. We recommend them for any space including kitchens, bathrooms, foyers, laundry rooms and living rooms. 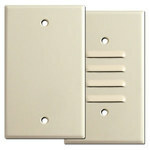 I have heard that ivory switch covers are primarily used in hospitals and don't want them to feel dreary in my home. Are they ever used in residential circumstances or only commercial? The point of a neutral colored switchplate is to have it be as least noticeable on a wall or complimentary to your decor. There are no guidelines related to which color wall plate to use in which environment. 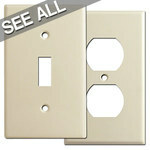 Ivory is a classic color for switch plate outlet covers and has been used in bungalow homes, ranches, classrooms, and yes, hospitals. I have a a very old home with a patterned wallpaper that is aged but I still love it. There are a variety of colors in it but primarily cream and gold. Would Ivory finish switchplates look ok? Absolutely. 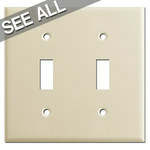 Our ivory plates are a very popular choice for homeowners with older houses. This particular finish resembles a bone color with some yellow, faint green and cream tones. It will help bring out the beauty in your wallpaper. Ivory wall plates look great on walls painted in yellow and beige tones such as Lucent Yellow, Lantern Light and Glad Yellow.